Join us for a reception and panel discussion with leading world-class specialists to commemorate the 110th Anniversary of the avant-garde artist and architect Lazar Khidekel (1904-1986), and to mark a new exhibition including original works at Pushkin House. The catalogue of the exhibition comprises essay by highly-regarded historian of the Russian avant-garde Dr Maria Kokkori, Research Fellow at the Art Institute of Chicago. Entry is free but spaces are limited. RSVP essential. Seating for the panel discussion is very limited and guests will be seated on a first come, first serve basis. Moderated by Dr. Regina Khidekel, the discussion gathers highly regarded specialists in Russian avant-garde to explore Suprematist painting and its development into architecture. Following a key-note talk by Dr Regina Khidekel, Professor Christina Lodder will explain the relationship between Khidekel and Malevich as architects. Professor Brandon Taylor will talk about the use of Suprematist and Constructivist ideas in more recent developments of modernism. The panel discussion will focus on Lazar Khidekel’s suprematist work, and his contribution to Russian avant-garde art and architecture. Also to be examined is his role in the transition of Suprematism from a 2-dimensional art form, to a movement which found its expresssion in real life - visible today in architecture, the processes of urbanization, and the futuristic yet environmentally-conscious city planning of the time. 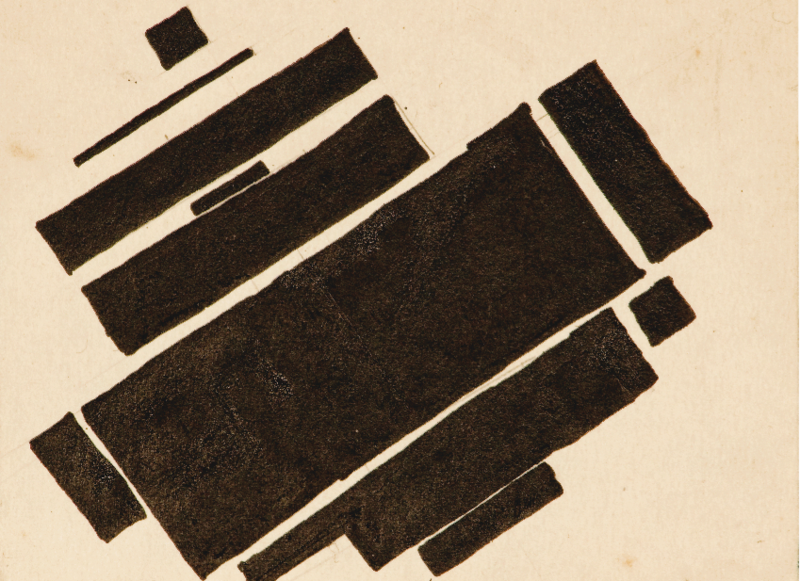 The exhibition will include twenty original works from Khidekel’s early Suprematist period (1919-1924) as well as drawings, photographs, documents underpinning the UNOVIS (Affirmers of the Young Art) movement, publications, including the legendary AERO, a 1920s handmade book - one of the first ecological manifestos of the modern era. This rich set of material comes from the Khidekel Archive, one of the most comprehensive archives of the Russian avant-garde. Dr Regina Khidekel is an art historian and curator, founding director of the Russian American Cultural Center in New York and the Lazar Khidekel Society. She received her MA and Ph.D. from the Academy of Arts in Leningrad. A frequent contributor to the magazines Iskusstvo, Dekorativnoe Iskusstvo, Teatr, Tvorchestvo in Russia and ArtNews in the USA, Regina Khidekel is the author of a number of catalogues and books, including Its the Real Thing Soviet and Post- Soviet Sots Art and American Pop Art by Minnesota University Press (1998). Regina Khidekels substantial contribution to the scholarship of Lazar Khidekel with her research, systemising work for the Lazar Khidekel Archive, and curatorial expertise resulted in a number of international exhibitions and publications including books, catalogues and periodicals. Christina Lodder is Professor of the History and Philosophy of Art at the University of Kent, President of the Malevich Society, and co-editor of Brill’s Russian History and Culture series. She has written extensively on Russian art of the early twentieth century, including Russian Constructivism (1983); Constructing Modernity: The Art and Career of Naum Gabo (co-author with Martin Hammer, 2000); Gabo on Gabo (co-editor with Martin Hammer, 2000); Constructive Strands in Russian Art (2005); Rethinking Malevich (co-editor with Charlotte Douglas, 2007); Utopian Reality: Reconstructing Culture in Revolutionary Russia and Beyond (co-editor with Maria Kokkori and Maria Mileeva, 2013); and a translation and introduction to Aleksei Gan’s Constructivism (2013). Profesor Brandon Taylor will talk about the use of Suprematist and Constructivist ideas in more recent developments of modernism. Brandon Taylor is Professor Emeritus in History of Art at Southampton University and currently Tutor in History and Theory of Art at the Ruskin School of Art, University of Oxford. His publications include Art and Literature Under the Bolsheviks (1991 and 1992), Art of the Soviets: Painting, Sculpture and Architecture in a One-Party State 1917-1992 (as co-editor 1993), Art Today (2005), and most recently After Constructivism (2014). Elena Sudakova is Founder, Director and Principal Curator of London's GRAD:Gallery for Russian Arts and Design. She has a special interest in Russian and former Soviet art, design and culture and is currently exploring experimental ways of addressing traditional art trends and objects through new-tech and digital applications. A documentary film on Lazar Khidekel, Kanal Kultura, 2011, will also be on display. Lazar Khidekel worked closely with Marc Chagall, El Lissitzky and Kazimir Malevich in Vitebsk from 1918 to 1922, where he became an important proponent and theoretician of Suprematism and a founding member of the UNOVIS group (Affirmers of New Art), which included other notable artists such as El Lissitzky, Nina Kogan, Vera Ermolaeva, Ilya Chashnik, and Nikolai Suetin. While still a student of Petrograd/Leningrad Institute of Civil Engineers (1922-1929), Lazar Khidekel became an influential force in fueling Suprematist ideas among faculty members and students, by lecturing, building bridges between LISI and INKhuK, and creating the first Suprematist architectural project - the Workers' Club (1926). Widely published in Russia and abroad, this project expressed the new direction of Leningrad avant-garde architecture, the Suprematist Constructivism. In the 1920s, Lazar Khidekel, the only architect in Malevich's group, developed innovative ideas for futurist cities which included communal houses and Suprematist skyscrapers, suggesting a new way of life. Among his realized projects were socialist towns conjoining industrial and residential complexes (1930-1932), the first radio-theater, House of Radio, the first three-hall Movie Theater, as well as schools and educational institutions. Khidekel’s projects of the 1930s were granted landmark status in the 1960s. Khidekel’s vision still manage to look futuristic, arguably more so than most of the Metabolists or Situationist projects that today feel retro-futurist, inextricably tied to the past. Khidekel’s work remains endlessly floating towards the future. First exhibition of the research departments of the Institute of Artistic Culture, May 25 to June 8, Leningrad, 1924. The international Lazar Khidekel Award next ceremony will take place in Baku in October 2014. Lazar Khidekel and Suprematism book by Prestel Publishing will be released on November 1, 2014.